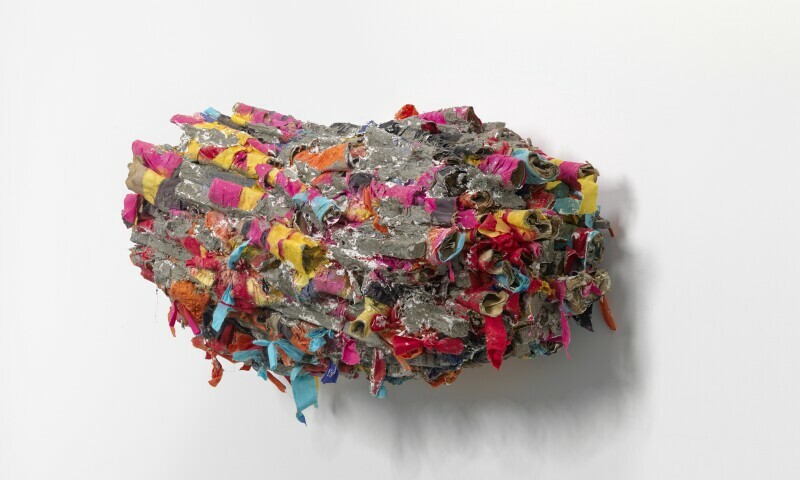 Phyllida Barlow, untitled: pressed, 2018. Cardboard, cement, PVA, paint, plaster, plywood, poly cotton, polyurethane foam, sand, spray paint, tape, timber, steel, 69 x 120 x 58 cm. Explore acclaimed British sculptor Phyllida Barlow’s new series of space-changing installations, spreading through the Royal Academy's new galleries. This spring, Barlow is creating an entirely new exhibition in the Gabrielle Jungels-Winkler Galleries. There will be rooms where her works invade the entire floor space, creating forests of structures, as well less populated areas, inviting speculation and altering the viewer's perception. As always with Barlow, colour will be a key theme, with graffiti blues, corals and candy pinks daubed and pressed into raw materials such as cardboard and plaster, which she often chooses over traditional sculpture materials. A key highlight will be an artwork evoking the architectural form of the portal, a doorway with a thick cement shadow, which will serve as an ‘entrance’ to her creation.